I received this as an ebook and I’m so curious if this will have that same velour fuzzy stuff on the cover that the first novel had. That stuff was the best. Much like the first comic book of Sarah’s Scribbles, I feel like all introverts need to read this. Sarah Andersen is so relatable it’s mind-blowing. Even things that don’t have to do with being introvert or having social anxiety were relatable to me. Like how she always steals her boyfriend’s clothes (hmm big sweaters) and the panel that describes all the alternative things a boyfriend brings to the relationship (I checked off each one). It feels like Sarah Andersen knows you personally, which makes me happy because it reminds me that even if I often feel alone in this world there are many people who do think/act like me. Even though there were a few panels that were very similar to previous ones I felt like the entire book was more inspiring than the last. I loved all of the female friendship positivity. And I might be an outlier here but I think I like this one better than her first book. Maybe just marginally as I gave them both 5 stars. Sarah you can do no wrong! P.S. I would also like to know how some girls have beautiful hair after four days of not washing. I’m definitely the second-day = gross hair type person. No amount of dry shampoo can tame these locks. GENRE: Non Fiction, Humor, Autobiography and Memoir. I thought I would enjoy this a lot more than I did. It just wasn’t as funny as I thought it would be, especially compared to Tina Fey and Ellen Degeneres’ book but it did have a few brilliant moments. There was probably only 2 really laugh-out-loud moment in the whole book though which was disappointing for me. 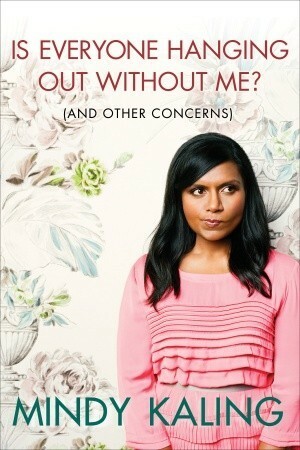 And after reading this I feel like Mindy has a lot more in common with Kelly from The Office than previously thought (which could be taken as good or bad). I mean most of the book was about boys and relationships. Not that this is necessarily a bad thing, I just thought the book was going to be different. She talked a little about her struggled before making it big on the Office but I wish there was more writing on that and less on the qualities of men she wants to date. I have to say, the thing about loving her parents too much and them being “pals” I realllllly loved. So it had a few shining moments, and I did like that she was completely unapologetic in terms of what she liked (style, music) and how she feels but overall what I took from this is that Mindy Kaling would make a seriously awesome best friend but a very annoying coworker.